I didn't want to like the latest album from Chasing Violets, Jade Hearts. With the hyper-stylized photograph of sisters Sarah and Melissa Fontaine gracing the cover, my expectations were low for another female fronted melodic rock band. Selling eye candy usually means there's a lack of real substance within. But it's not the case. Hey boys! My eyes are up here. Once more produced by AOR hero Frederic Slama, the Fontaine sisters get some heavyweight help from the likes of Tommy Denander (Alice Cooper, Paul Stanley), Paul Sabu (Kidd Glove), Goran Edman (Yngwie Malmsteen), Mikael Erlandsson (Last Autumn's Dream), and Bob Harris (Axe), to name just a few. Pairing the girls, who have superb voices, with talented musicians and well-written songs, though I don't know how much they contribute, results in a pleasing album of AOR melodic rock. Most of the material fits that smooth AOR style, with songs like Secrets in the Shadows, Jade Hearts, and Hollow Triumph having a West Coast feel as well. But the Fontaine's also explore a bit heavier side of the AOR spectrum with the more melodic hard rock of I Owe It To Myself, Halo of Light, Web of Lies, Deception in Heaven and Silent Victory, the best song here. Perhaps the most curious thing about the songs is that most time at five minutes or better. In the case of the longest song The Scarlet Nymph this rather uninteresting song isn't helped by the additional length. An even more curious observation is that there's minimal difference between Sarah and Melissa vocal style. The seem a mirror image of each other. Which you would respond, well, they're sister after all. In the end, after several spins, I did like Chasing Violets Jade Hearts. Certainly some songs were stronger than others, and often the Fontaine sisters vocal presentation became predictable, but this is a very good album of AOR melodic rock. 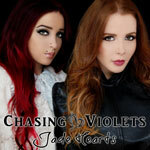 More than mere eye candy, Chasing Violets, featuring sisters Sarah and Melissa Fontaine on vocals, offer some very good AOR melodic rock on their second release Jade Hearts.